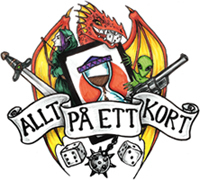 Första expansionen i War of Five Kings-cykeln till A Game of Thrones: The Card Game (2nd Edition) med 60 nya kort att bygga lek med! The comet’s tail spread across the dawn, a red slash that bled above the crags of Dragonstone like a wound in the pink and purple sky. In the aftermath of Robert and Eddard’s deaths in King’s Landing, the Great Houses of Westeros have pulled away from each other. Joffrey Baratheon has been crowned king, and now sits the Iron Throne, but Robb Stark has already been proclaimed King in the North, and Stannis plots in his fortress of Dragonstone, brooding on a throne that should have been his. It is the calm before the tempest: war in Westeros is imminent, and above it all, the Dragon’s Tail burns a blood-red trail across the sky. 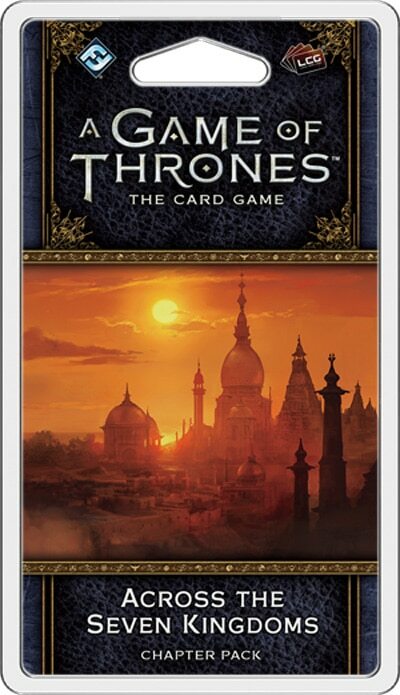 Enter the War of the Five Kings with Across the Seven Kingdoms, the first Chapter Pack in the War of Five Kings cycle for A Game of Thrones: The Card Game! As the War of Five Kings cycle moves forward to highlight the thrilling battles and intrigue of A Clash of Kings, Across the Seven Kingdoms invites the Houses to call upon their loyal bannermen as a multitude of new Kings arise to claim the Iron Throne. What’s more, this Chapter Pack begins to introduce effects based on the Summer and Winter plot traits, allowing the long-lived seasons of Westeros to play a more integral role in your combats. With new King versions of Robb Stark and Viserys Targaryen entering the game alongside characters like Arry and Janos Slynt, this Chapter Pack marks the explosive beginning of the War of Five Kings cycle!